"I'm Cu Sith. Um, I hope we can be friends. What would you like to do?" Apply Charm to enemies at target. "He attends an academy in Ueno popular among Therian transients, particularly the furry type. He's a bit of a crybaby, but his usual cheerful and very friendly nature makes him very likeable. 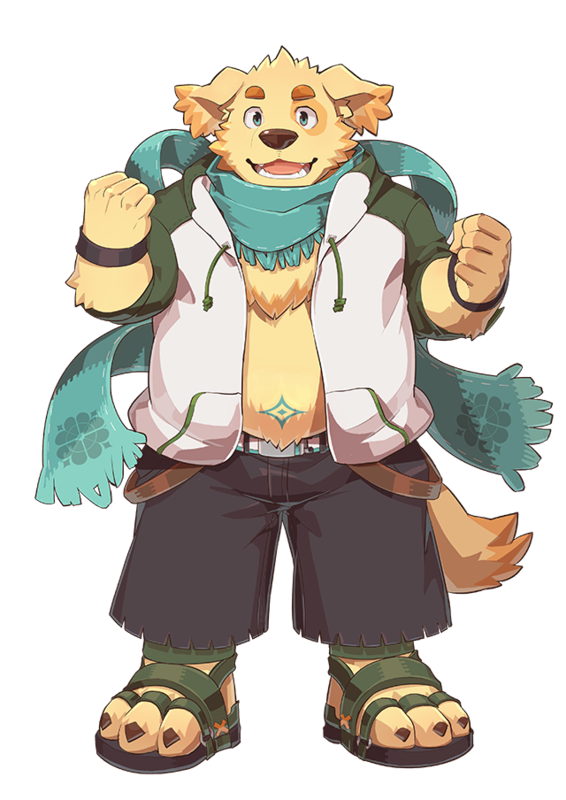 Before he was summoned, he was kept as a guard dog by the fairy Gruagach, who was Cu Sith's Summoner, but also his father, brother, and irreplaceable family. However, his former master is now nowhere to be found." A gentle dog beastman attending an academy in Ueno, where many beastmen from the various worlds study. Although he's a bit of a crybaby, his bright disposition and cheerful, friendly personality make him well liked among his peers. Before being summoned to Tokyo, he served as a guard dog to a fairy lord presiding over fortune and good luck, Guraghach. Although he was Cu Sith's master by title, he was also a father, and older brother, and irreplaceable family. However, he passed on some time ago. "The Sacred Artifact given to Cu Sith is a Scarf with a prayer for his happiness woven into it and a Rule that brings good fortune. The memories of his previous master are warm and always bring tears to his eyes, along with a little howling when he thinks of them during sad times. Cu Sith's howls have the power of eliciting empathy. When people hear those sad cries, their aggressive impulses are suppressed. The third cry, however, will become physical shockwave that blasts all who are within range." Cu Sith's sacred and most treasured possession is his scarf; knit by Guraghach as a lucky charm, with a prayer that his soft-hearted guardian live a happy life. When alone, the sight of the scarf sometimes brings him back to memories of living with his former lord, the good times and the bad, and he can't stop the tears from welling up. Cu Sith's voice has the ability to resonate with emotions; those who hear it with ill intent in their heart are forcibly repelled. The third howl creates a powerful physical shock capable of blowing away almost anything. I'm Cu Sith. Um, I hope we can be friends. What would you like to do? I won't let you pick on my friends. Something like this... You're terrible... Just go away... Uuu.. UuAAAAAAHH!! Was I able to get just a little bit stronger...? Uu.. uuu~! Apply Countdown to enemies at target. "Super excited for the Halloween Party at his school, Cu Sith is dressed up as a werewolf. He just can't wait to trick or treat for some candy! However, whether the Halloween atmosphere got to him or he was inspired by his friend, the Black Dog, he took that image to heart and now looks just like the Black Dog... In other words, he’s taken on the form of that dog buried in a shallow grave and left behind, considered to be the messenger of death... but that doesn't change his true nature as a guard dog for children." The Summon Cu Sith who has come to the festival dressed as a werewolf. He is completely excited by the festive atmosphere within the school grounds. He's bracing himself to go trick or treating for candy. Whether it's because Halloween has filled him with a strange energy or the influence of his black dog acquaintance, his appearance unmistakably that of a black dog ghost. In other words the one first buried in a graveyard, the dark fey dog fated to be left alone and messenger of death. And yet still, his true nature as a guard dog that protects children will not change. Here I am, invited to such a sweet and fun place, ehehe! I'm Cu Sith. I'll be the best werewolf! Trick or treat! Now you gotta give me sweets! Get ready for a fright! Okay, here comes a trick! Third Howling! Hoooowllll!! Hooray, we won! Let's reconcile with a handshake. Cu Sith's character borrows heavily from the mythology of Cu Siths, a type of dog fairy in Scottish legend. Like the character, Cu Sith were depicted as guardians to the fae realm. His Third Howling charge skill reflects the ability Cu Siths were most noted for: a terrible howl that could strike a man dead from terror if he did not escape before hearing the third. yep! His LQ just translates to "I love you! Hehe! Let's be together forever." Okay I can't make out the second half but the first half of his LQ sounds like it seems to be "kimi no koto daisuki"
THIS GOOD BOY DESERVES NO SADNESS! PLEASE DO NOT BULLY! I used an anniversary ticket to help him come home. I have no regrets. Never piss off this good boy, your HP might end up to 1 in an instant! why do people wanna punch the precious boy??? Shingo Yabuki, is that you? Cu Sith deserves a long warm hug. Fams, this pup is mine. No contest, so back off my mans, can ya dig it? Cute Sith's toes are mine. All six of them! This page was last edited on 25 November 2018, at 22:13.